We are presenting a case report of a patient complaining of severe pain consistent with nerve injury immediately after cervical epidural steroid injection. 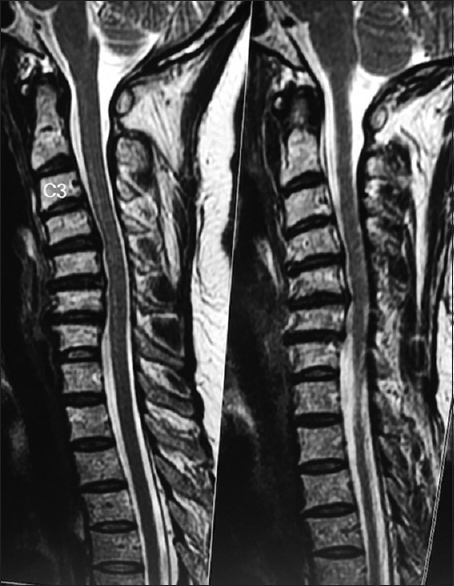 A 47-year-old woman came with a history of severe neck pain radiating to the left arm for the past 2 months. Similar complaints were reported 2 years back, which was treated conservatively with analgesics and rest. The patient did not have any comorbidity. There was no weakness or sensory change in the arms or legs. On physical examination, marked limitation of cervical range of motion in flexion and extension was noted. Sensory, motor, and deep tendon reflex examination in all extremities yielded normal results. 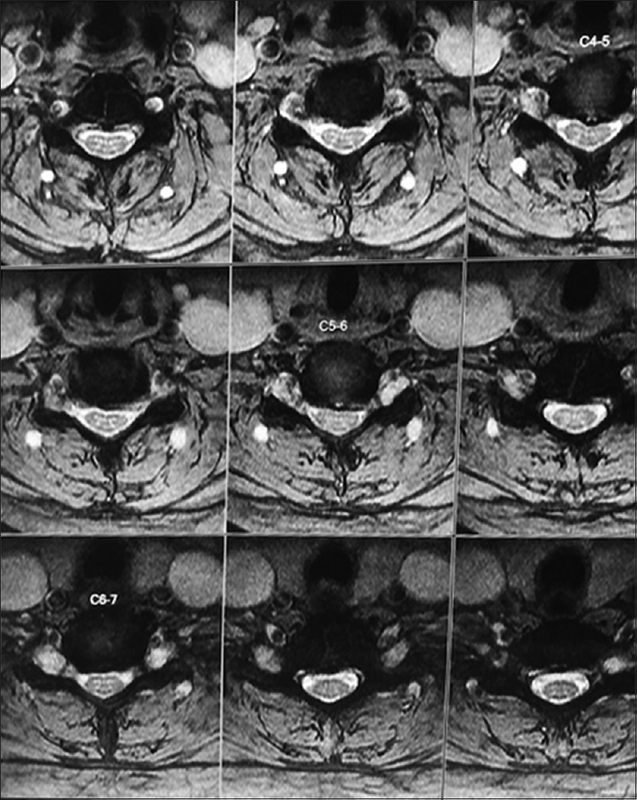 Magnetic resonance imaging (MRI) showed prolapsed intervertebral disc C5–6, C6–7 with the left nerve root indentation [Figure 1] and [Figure 2]. Cervical epidural steroid injection by midline approach was performed with the patient prone position, with neck flexed, head resting on a cushion. Both hands were on the side of the body. The epidural space was identified and 18G Tuohy needle was advanced using the loss of resistance technique through the C7-T1 interspace by midline approach. No blood or cerebrospinal fluid was aspirated from the needle. A volume of 1.5 ml contrast (Iohexol) was injected to confirm the needle position. A mixture of 40 mg methylprednisolone (diluted in 4 ml saline) and 1% lignocaine (1 ml) was administered through the epidural needle. There was no resistance observed while injecting medications. There was transient paresthesia in the right upper arm and hand during injection. Symptoms experienced after injection of 3 ml methylprednisolone, we stopped for 5 s and injected the remaining 1 ml. Several minutes after the procedure, the patient had exacerbating pain and allodynia in the index finger and thumb of the right hand. Pain and allodynia in the right hand persisted through the patient's discharge from the hospital after 2 h. The patient had the same radicular pain in the left arm at the time of discharge from the hospital. Following day patient complained of severe pain in the left forearm and hand. There were burning and sensitivity to light touch and swelling of the dorsum of the hand. Pain and allodynia in the right hand was reduced considerably. On examination, there was marked allodynia, warmth, erythema, and swelling of the left hand. Sensory examination showed decreased sensation to pinprick. She was prescribed a tapering dose of oral steroids, pregabalin, and analgesic-muscle relaxant combination. Weekly follow-ups for 4 weeks showed that her symptoms gradually resolved and no further intervention was needed. Original radicular pain resolved completely and the patient was treated with physiotherapy. Earlier, three case reports with similar neurologic sequelae have been published., In one report, Siegfried  reported a patient with lancinating pain in the right arm after CESI as the epidural needle was withdrawn. Allodynia occurred 6 h later in the same extremity, associated with symptoms of increased sympathetic activity (cool, swollen arm). Cervical epidural steroid injection was performed without sedation using a midline approach and the hanging drop technique at the level of spinal cord impingement shown by computed tomography (C5–C6). No cerebrospinal fluid or blood was aspirated during the procedure, but because a local anesthetic test dose was not used, dural puncture could not be excluded. In another report by Hodges et al., two cases of cervical epidural steroid injection with the use of fluoroscopic guidance in sedated patients. For both, injections were performed at the level of disk herniation (C5–C6) shown by MRI and resulted in the subarachnoid placement of the needle, with the return of cerebrospinal fluid. Although neither patient reported symptoms during the procedure, both awoke with new neurologic symptoms and subsequently had spinal cord injury shown by MRI and permanent neurologic sequelae. The authors concluded that the use of fluoroscopic guidance does not prevent dural puncture and that excessive sedation may mask warning signs of neural impingement during cervical epidural steroid injection. One recent case report  of a 61-year-old patient, who developed complex regional pain syndrome (CRPS) type II after a cervical transforaminal epidural steroid injection (CTESI). The patient developed sudden-onset severe pain and swelling of his upper right limb after a CTESI. Patient's symptoms and signs corresponded to the Budapest criteria for CRPS. A three-phase bone scan showed increased uptake in the right wrist in all phases. He was diagnosed with CRPS type II due to a cervical nerve root injury caused by the transforaminal epidural injection. The patient received oral methylprednisolone and gabapentin and underwent physical therapy for 9 days. The pain and swelling disappeared, and he returned to his previous functional activities. CRPS type II due to cervical root injury is rare but can develop during CTESI. In two patients in whom, signs and symptoms of nerve injury developed after the procedure using a standard midline technique. In one patient, transforaminal approach was used and the patient developed CRPS. The cases of nerve injury occurred with different practitioners in different practice locations. In our case, even though the pain was unilateral, we used midline approach because this is a safe approach as compared to transformational in the cervical area. There are different opinions about using particulate or nonparticulate steroid. However, there is enough evidence to use particulate steroid so we used methylprednisolone in this particular case. At least two mechanisms can explain the neuropathic pain experienced by this patient. Patient reported painful paresthesia during cervical epidural steroid injection, suggesting that the needle tip was near an exiting nerve root. Needle tip touching the exiting nerve root is unlikely in midline interlaminar approach. The symptoms were transient, and methylprednisolone was administered. The methylprednisolone formulation used is a particulate suspension of steroid in polyethylene glycol. This formulation has been implicated as a cause of neural toxicity. Perhaps, deposition of the steroid near the exiting nerve root led to nerve root irritation. Increased neuropathic pain after cervical epidural steroid injection may result from either a direct nerve root irritation caused by the steroid solution or nerve root injury. Direct nerve root irritation by steroid injection is most probable cause in the midline interlaminar approach. Abram SE, O'Connor TC. Complications associated with epidural steroid injections. Reg Anesth 1996;21:149-62. Manchikanti L. Cervical epidural steroid injection with intrinsic spinal cord damage. Spine (Phila Pa 1976) 1999;24:1170-2. Hodges SD, Castleberg RL, Miller T, Ward R, Thornburg C. Cervical epidural steroid injection with intrinsic spinal cord damage. Two case reports. Spine (Phila Pa 1976) 1998;23:2137-42. Siegfried RN. Development of complex regional pain syndrome after a cervical epidural steroid injection. Anesthesiology 1997;86:1394-6. Park GY, Kwon DR, Kwon DG. Complex regional pain syndrome type II after cervical transforaminal epidural injection: A case report. Medicine (Baltimore) 2018;97:e10784.